I've been posting more frequently about the Dungeoneer roleplaying game lately, but there is another product that has been quietly brewing in the background. It is a product that bridges the gap between the Dungeoneer roleplaying game and the Dungeoneer card game. It is called Dungeoneer Scenarios. It is a document that I have long been working on, adding little bits over the months and years as ideas come to me, or as I read interesting things on the interwebs. It is a collection of optional rules, and most importantly pre-constructed scenarios for the card game - which coincidentally are highly useful for the roleplaying game. One of the major topics are the rules. Nearly half of Dungeoneer Scenarios is devoted to the "crunchy bits" that make up the game. Illuminating how things work and offering alternatives and expansions. My post here today is an excerpt from Dungeoneer Scenarios explaining the different editions of the rules. Dungeoneer has gone through 5 versions of rules. The original version was published by Citizen Games in the first ever Dungeoneer set. The final version, called Legendary Dungeoneer Rules version 2.3, was published by Atlas Games in the Legendary Dungeoneer: Wrath of the Serpent Goddess set and represents years of playtesting and feedback by Dungeoneer players from all around the world. Why so many versions of the rules? The primary reason for multiple editions of the rules is that the game expanded with each set. This meant new cards with new card effects, and these had to be accounted for and explained as the rules developed. Also, there was tremendous feedback from the Dungeoneer community that helped to clarify and correct sections of the rules. These clarifications where added with each version. The original rules were concise and bare-bones. The strength of this rules set was its simplicity and brevity. It cut straight to the point and was designed to fit on a small sheet of paper with minimal graphics. Unfortunately it suffered from being too terse on key points that needed elaboration. It was most criticized for appearing to have 2 contradictory win conditions. The win goal of completing 3 Quests was the correct win goal, but another paragraph seemed to suggest you won by achieving 4th level, which if you complete 3 Quests you probably would be 4th level, however there was a card in the set called a Wraith that could drain levels from your Hero, making it possible that you could complete 3 Quests without achieving 4th level. This rule set benefited from the feedback of many players and elaborated on several fine points in the rules. The release of 2nd edition Dungeoneer by Atlas Games represented increased production values with full color backs and better card stock. Several desirable elements that were missing from the original game were included in this revision of the game, including expanded Monster stats and the ability for Heroes to initiate attacks of their choice. The rules also featured a whole new mode of play called Campaign where one player acted solely as the Dungeonlord while all the other players participated solely as Heroes co-operating to complete their Quests. (These campaign rules are included in a revised and improved format in this book) Unfortunately these improvements also made the 2nd edition cards essentially incompatible with the 1st edition. In response to increased criticism regarding confused wording on some rules this version 2.1 was a refinement of the v. 2 rules. These rules remained the standard through most of the Dungeoneer releases until the Epic set. Unfortunately by clarifying the length of the rules grew. Campaign play was removed in favor of a section of “best of” optional rules that were in common use by Dungeoneer players. The release of an Epic set meant new rules had to be incorporated to account for higher levels and explanation for combining Heroic level sets with the new Epic set. These rules were a complete rewrite and revision of the v. 2.1 rules and expanded on describing common card effects and optional rules. This rule set was greeted with the most positive response from the Dungeoneer community as being the best rules set to date. The release of the Legendary set required additional rules to explain combining sets of various levels. Care was taken not to mess up what players liked about the v. 2.2 rules. Only a small section was re-written to accommodate expanded and revised explanations required for using the Legendary and Epic sets with other sets. 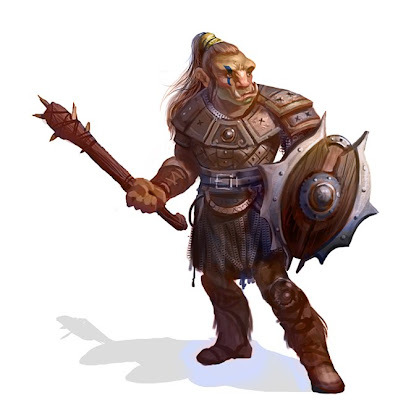 Here is another illustration that will be accompanying the ogre description in the Dungeoneer RPG Player's Guide. Hello, welcome to another Dungeoneer Roleplaying Game update. This week we take a look at the Ogre, one of the 6 races you can choose from in the core rules. An ogre (feminine: ogress) is a large, cruel and hideous humanoid monster. They are brute creatures who seek only to serve their own pleasures: usually finding shiny stuff, killing things, and eating food. The common mythical perception is that ogres feed on human beings, which is not true, unless they are feral or extremely hungry, or in a particularly bad mood. Ogres have a large head, protruding tusks, abundant hair and beard most often of a reddish or dark brown color, small dark eyes, a voracious appetite, and a large strong body. Their skin is ruddy, leathery, and tough. Considered the smallest, or runts, of the giant family, ogres are rarely accepted in civilized lands. Indeed, they are also not always welcome by giants in the mountainous regions they inhabit. Most ogres are from rural, savage, or even esoteric cultures. Those from distant or exotic lands may seem to be more intelligent, or refined. Being ferocious in combat, but generally not smart enough to make good wizards, ogres tend to excel at being warriors or barbarians. Intimidate (pay 1 glory): chosen enemy has -1 Melee for the duration of this combat. Limit once per combat. Charge (pay 2 glory): one attack can be aimed at up to 3 enemies. You roll attack once, each opponent rolls defense normally. Limit once per combat. Bullrush (pay 3 glory): +2 Melee against all opponents this combat. Limit once per combat. I hope you enjoyed this week's update. I've been doing a lot of art and writing, as usual being productive in my studio means being unproductive on this here blog. Hopefully next week's post will be more prompt. Thanks for visiting!